Before taking any medicine for any disease, self-evaluation about what you are eating is good. Our life style and what we eat determines our health, it is the main reason for every disease. There is no need of any treatment or medicine if we correct our life style and food selection. Avoid foods that contains trans-fat. Avoid all type of fast food. All types of soft drinks should be avoided because they contain preservatives and essence. Avoid artificial taste-makers and foods that are made up using it. Iodized salt should be avoided. Avoid modern medicine that is harmful to our body. Allopathy medicines cannot cure any disease instead it increases the disease by hiding the actual symptoms. The juice of Stinging Nettle (Tragia Involucrata) leaf. The juice of Cleome Viscosa. Take all three equally, then mix everything and boil till the water evaporates completely. Apply this on head one hour before taking bath. Its good if applied on head after bath also. 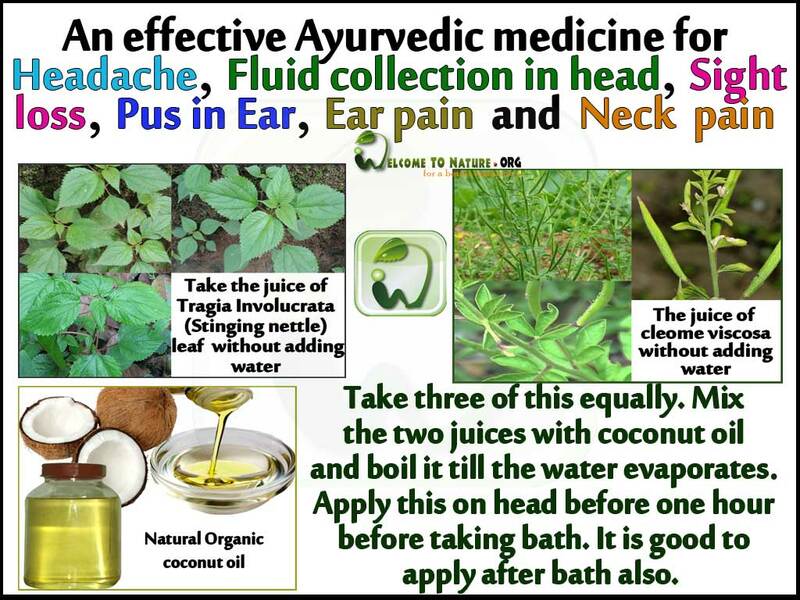 This medicine is effective for headache, fluid collection in head, ear pain, ear pus, sight loss and neck pain. Anyone can use this. If you find a natural solution for every problem of your body, then it is good for your future health because we are also a part of this nature. Cleome viscosa is not available in the area where i live, so is it ok if i use only stinging nettle and coconut oil. I have the above symptoms. I will be very greatful for your reply. Sir, i am living in Odisha and i could not understand the name of herb. Can you provide the mix because i am suffering from sever head ache and and fluid collection in head?